There is a certain “buyer beware” element of purchasing any used forklift. Of course, the AFS technicians and mechanics go over every inch of every used unit, and there are things you can do to make sure your newly-purchased used forklift will give you several years of good work. The forklift starts and runs and moves forwards and in reverse. Leak-free and tires in decent shape. Forklift is thoroughly inspected by AFS, repairs as needed, no leaks (guaranteed), tires in great shape. Forklift is thoroughly inspected by AFS, repairs as needed. No leaks, guaranteed. New paint, new tires. Beginning on the day of the delivery, forklift is covered bumper to bumper for six months. “Wear” items such as filters, tires, tanks, brakes and forks are not covered. There are plenty of opinions about extended warranties and if they are worth the money or not. On one hand, having the extended warranty could save you thousands of dollars in repairs if your used forklift runs into trouble. On the other hand, your forklift may never run into any mechanical trouble meaning you’d pay for the extended warranty and never use it. The real logic behind the decision is asking yourself how long you intend to keep the unit, and what you will be asking it to do- is it a heavy workload? Take into consideration just how old the used forklift is and how much life it may have left. It may very well be worth the gamble. 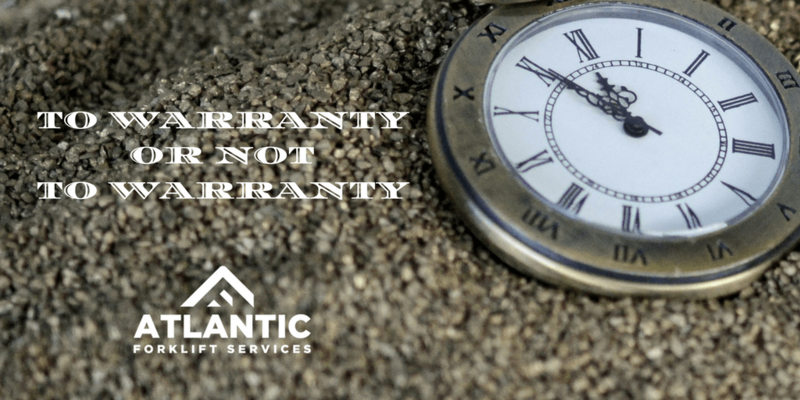 If you have any questions about warranties, our guys are just the best in the business and they’ve got all the answers if you call (704) 842-3242 with questions.